Box of text, with Famous Funnies being larger than the rest. Also contains a check-mark in the upper left corner. This Is a Famous Funnies Publication Eastern Color 242 1946 1956 Box of text, with Famous Funnies being larger than the rest. Also contains a check-mark in the upper left corner. Bell Features 1950 1950 Used on Canadian reprints of some Famous Funnies comics. Club 16 Comics (1948 series) #1 June 1948 Famous Funnies, Inc.
Club 16 Comics (1948 series) #2 August 1948 Famous Funnies, Inc.
Club 16 Comics (1948 series) #3 October 1948 Famous Funnies, Inc.
Club 16 Comics (1948 series) #4 December 1948 Famous Funnies, Inc. Famous Funnies (1934 series) #148 November 1946 Famous Funnies, Inc. Famous Funnies (1934 series) #149 December 1946 Famous Funnies, Inc. Famous Funnies (1934 series) #150 January 1947 Famous Funnies, Inc. Famous Funnies (1934 series) #151 February 1947 Famous Funnies, Inc. Famous Funnies (1934 series) #152 March 1947 Famous Funnies, Inc. Famous Funnies (1934 series) #153 April 1947 Famous Funnies, Inc. Famous Funnies (1934 series) #154 May 1947 Famous Funnies, Inc. Famous Funnies (1934 series) #155 June 1947 Famous Funnies, Inc. Famous Funnies (1934 series) #156 July 1947 Famous Funnies, Inc. Famous Funnies (1934 series) #157 August 1947 Famous Funnies, Inc. Famous Funnies (1934 series) #158 September 1947 Famous Funnies, Inc. Famous Funnies (1934 series) #159 October 1947 Famous Funnies, Inc. Famous Funnies (1934 series) #160 November 1947 Famous Funnies, Inc. Famous Funnies (1934 series) #161 December 1947 Famous Funnies, Inc. Famous Funnies (1934 series) #162 January 1948 Famous Funnies, Inc. Famous Funnies (1934 series) #163 February 1948 Famous Funnies, Inc. Famous Funnies (1934 series) #164 March 1948 Famous Funnies, Inc. Famous Funnies (1934 series) #165 April 1948 Famous Funnies, Inc. Famous Funnies (1934 series) #166 May 1948 Famous Funnies, Inc. Famous Funnies (1934 series) #167 June 1948 Famous Funnies, Inc. Famous Funnies (1934 series) #168 July 1948 Famous Funnies, Inc. Famous Funnies (1934 series) #169 August 1948 Famous Funnies, Inc. Famous Funnies (1934 series) #170 September 1948 Famous Funnies, Inc. Famous Funnies (1934 series) #171 October 1948 Famous Funnies, Inc. Famous Funnies (1934 series) #172 November 1948 Famous Funnies, Inc. Famous Funnies (1934 series) #173 December 1948 Famous Funnies, Inc. Famous Funnies (1934 series) #174 January 1949 Famous Funnies, Inc. Famous Funnies (1934 series) #176 March 1949 Famous Funnies, Inc. Famous Funnies (1934 series) #177 April 1949 Famous Funnies, Inc. Famous Funnies (1934 series) #178 May 1949 Famous Funnies, Inc. Famous Funnies (1934 series) #179 June 1949 Famous Funnies, Inc. Famous Funnies (1934 series) #180 July 1949 Famous Funnies, Inc. Famous Funnies (1934 series) #181 August 1949 Famous Funnies, Inc. Famous Funnies (1934 series) #182 September 1949 Famous Funnies, Inc. Famous Funnies (1934 series) #183 October 1949 Famous Funnies, Inc. Famous Funnies (1934 series) #184 November 1949 Famous Funnies, Inc. Famous Funnies (1934 series) #185 December 1949 Famous Funnies, Inc. Famous Funnies (1934 series) #188 June 1950 ? Famous Funnies (1934 series) #191 December 1950 ? 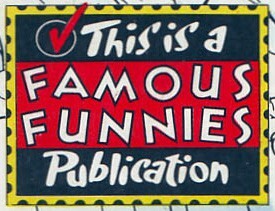 Famous Funnies (1934 series) #212 July 1954 ? Jingle Jangle Comics (1942 series) #24 December 1946 Famous Funnies, Inc.
Jingle Jangle Comics (1942 series) #25 February 1947 Famous Funnies, Inc.
Jingle Jangle Comics (1942 series) #26 April 1947 Famous Funnies, Inc.
Jingle Jangle Comics (1942 series) #27 June 1947 Famous Funnies, Inc.
Jingle Jangle Comics (1942 series) #28 August 1947 Famous Funnies, Inc.
Jingle Jangle Comics (1942 series) #29 October 1947 Famous Funnies, Inc.
Jingle Jangle Comics (1942 series) #30 December 1947 Famous Funnies, Inc.
Jingle Jangle Comics (1942 series) #31 February 1948 Famous Funnies, Inc.
Jingle Jangle Comics (1942 series) #32 April 1948 Famous Funnies, Inc.
Jingle Jangle Comics (1942 series) #33 June 1948 Famous Funnies, Inc.
Jingle Jangle Comics (1942 series) #34 August 1948 Famous Funnies, Inc.
Jingle Jangle Comics (1942 series) #35 October 1948 Famous Funnies, Inc.
Jingle Jangle Comics (1942 series) #36 December 1948 Famous Funnies, Inc.